We believe that the Bible though written by many authors, it was written by the Holy Spirit. We believe every word that is written in the Bible and none of it is there by accident or by mistake. We believe that there is only one God and that there is no other god. We believe in the trinity that is our God is three in one. We believe that God the Father, God the Son and God the Holy Spirit are one. We believe that Jesus was the Messiah and that he died and rose again. Now we are preparing and waiting for his Second Coming. This website was born with the hunger and sole purpose of reaching out to every soul of every age group out there. We have below sections in our website to target audience as per their age group. Blog – This page is for all the age group, the articles which are posted are of general topics. Weekly Manna – We publish a sermon every Sunday as Weekly Manna on this page. 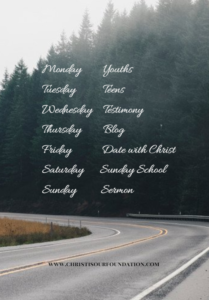 Young Samuel’s Block – This page is dedicated to Sunday School students and teachers. We will be adding teaching material and articles on how to up bring your child to Christ. Samuel was still a child when his mother brought him to the temple of God, where he grew under the grace of God to be the prophet, priest and acting King of Israel. Josephine – This page is targeted for Teens, the name Josephine was given because Joseph was still very young probably in his teens when he sold as a slave but throughout his journey, God was with him and the same thing we want to inculcate it in our teens. Daniels – This page is targeted for youths, an age when you have lots of energy and you can do so many things for Christ. Daniel and his friends stood strong in their faith even at the point when they faced death. Testify – We have this page and publish testimonies of all the people around the world. A Date With Christ – This page is like Bible Study, to walk with God and know God more deeply. We publish an episode every week. Prayer Hall – Do you have any prayer request, share it with us, you can anonymously share the request if you want to, be assured that we will pray for you. The weapon of prayer is more powerful than you can imagine.